The Cold War may be over, but spy photos from the era are now a hot commodity with archaeologists. During the 1950s and the 1960s, American U-2 spy planes flying top-secret missions over the Middle East, Eastern Europe and the Soviet Union snapped countless high-resolution photographs of military installations on the ground below. But the photos, which were declassified in 1997, contain a vast trove of visual information about ancient villages and agricultural structures — including some in places that are now too dangerous to visit in person and others that may have been destroyed in recent decades. Hammer is co-author of a new study, published March 12 in the journal Advances in Archaeological Practice, that used the black-and-white images to get an unprecedented look at Bronze Age villages and 3,000-year-old irrigation canals in southern Iraq, and prehistoric walled structures known as "desert kites" that were used as hunting traps in eastern Jordan. The photos taken by the U-2 spy planes capture objects on the ground with remarkable detail even though their cameras were routinely used at altitudes as high as 70,000 feet — almost twice as high as commercial airliners fly. “Cameras in the 1950s were just as good as they are now — they just weren’t digital,” Hammer said. For their research, Hammer and her collaborator, Harvard anthropologist Jason Ur, cataloged photos from 11 separate U-2 photo reconnaissance missions over the Middle East during the 1950s and the 1960s. The photos were not indexed in any way, forcing the pair to unspool hundreds of feet of film, photograph them to create digital copies, and then carefully stitch the frames together to recreate the flight paths of the spy planes. "There was no way to search by keyword or anything, much less figure out what photos might cover a particular area that you're interested in," Hammer said. "We built a spatial index where people can go to a place on a map and see if a U-2 plane flew over this area, and see if its cameras were on at the time and if it took pictures, and the date of those pictures." And there may be plenty more U-2 photos for archaeologists to pore over. 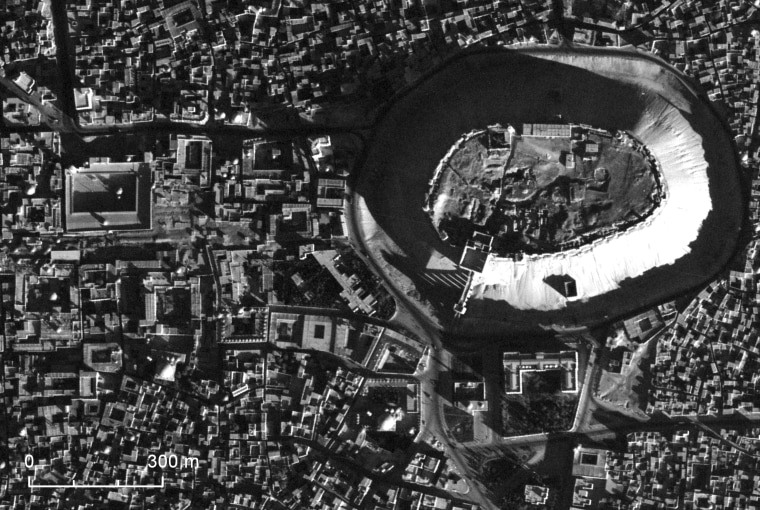 In addition to studying ancient sites, Hammer hopes the U-2 archive will be useful for people who are monitoring archaeological sites in conflict zones, particularly in places that have suffered destruction in recent decades. Want more stories about archaeology?